The OUHK offers high-quality learning resources for all academic disciplines, including business, education, science and technology, and the arts and social sciences. 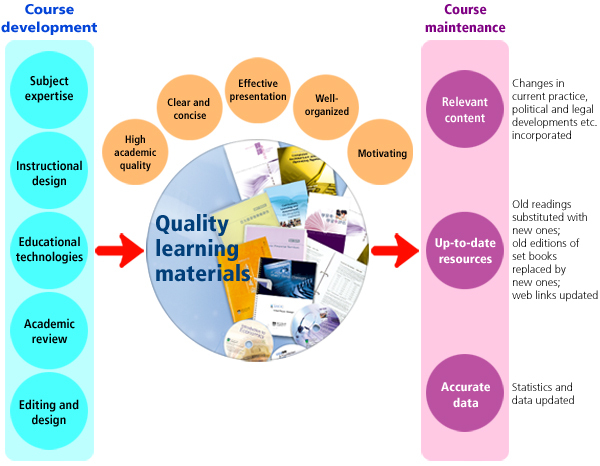 All materials are developed or adapted using a systematic course team approach, and are subject to stringent quality assurance mechanisms to ensure high quality. Once developed, the courses are regularly updated and periodically reviewed to maintain this high standard of quality. The ETPU is actively involved in both the development and maintenance of OUHK courses. It is responsible for the instructional design, editing and graphic design, multimedia development and audio-visual production of courses, as well as delivery of print and digital content.